Regent’s Park Open Air Theatre, well to do, sedate and attracting a gentle audience who probably owned their own houses. A group of posh six-formers think they are the history boys and crack wise but unfortunately lack the writing of Alan Bennet. There is a large corporate group, (which I infiltrate and grab a free Pimms). Indeed, it seemed that half the audience were there to ‘show they were alive’ and I longed for a Captain Mirven to come in and sort them out. Peachum (r) and Lockit have a little chat. I took my seat early, and tried to look at the set, but most of it was covered in a huge banner announcing ‘The Beggar’s Opera - A Newgate Pastoral’ and a tremendous picture of all the whores and rogues depicted in as if they were Patrolicus and Eupheminie and all the other saps of pastoral poetry. The theatre rings a bell to announce the imminent opening of the play, and the sound of the increasingly desperate handbell trying to get the audience in, the excited chatter of the audience and the rattling of chains some where, mixed with the woosh of the wind made a really evocative sound. 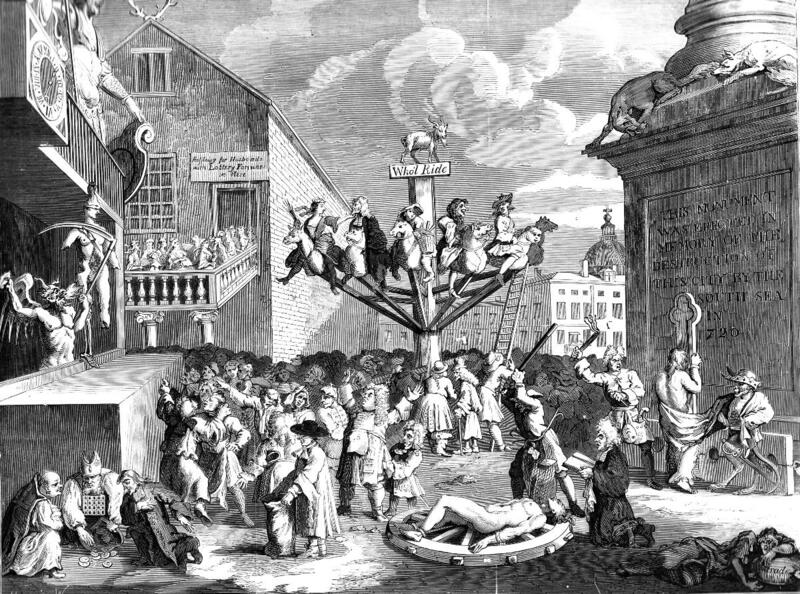 This was burst by a whistle, the banner was dropped, revealing a scaffold with eight nooses and small room made of a large barrel and a bed that we later learnt was built from a cart of the kind used to carry people to execution...people start doing maypoles with chains and so the play was under way. The first scene is with Peachum and Filch. Peachum is toughier, flintier and less fruity then the films I’ve seen. He’s a harder man, which makes all the talk of death seem real and possible. He also gets the first laugh of the night with his first line, ‘A lawyer is an honest profession.” Filch, his assistant is played effetely, giving variety to his scenes. Through the songs, extras are used (and abused) to add visual interest to the songs and provide movement, especially in this static first part of the play. I have never enjoyed the part of Polly Peachum, she always strikes me as more than a bit wet, but when Polly came on in this production, I was won. In the scenes in the first half, with her family and Macheath she was played partly as a petulant little girl and partly as the only adult in the piece. There is something about the seriousness of Polly compared to the double-dealing and gameplaying of everyone else that gives her dignity. Polly unfortunetely suffers in the second half when she becomes more whiny - and less lively than her rival Lucy Lockit. Macheath on the other hand is the opposite, the performer lacked a certain spark as the swaggering rake, but was much stronger in the later scenes of self pity and defience in front of death. 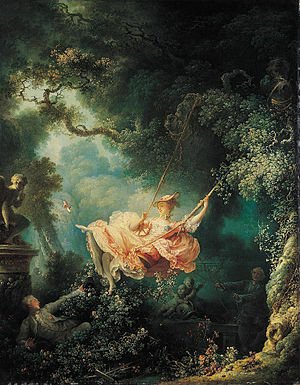 There were a number of allusions to eighteenth century painting, one of the most blatant of which was during the romantic ‘over the hills and far away’ when a swing dropped from the scaffold and Polly was swung in it, while Macheath lay on the floor and someone dressed in gold as a cupid came on to watch. It looked a bit like this. The romance of the scene led to a very strong contrast with the next one, in which Macheath’s gang got ready to take to the road and rob, mainly by beating each other up. When they had gone, Macheath could enjoy his bevy of beauties who all came on from different angles, some through the audience. They laughed and joked, they did stripteaze, Macheath even put his pistol suggestively up one of their dresses - this is when the young families started to walk out. They cut the end of the first act so that it focussed more strongly on Macheath’s arrest and we were ready for the second half. Act two was stronger than the first. The scenes are written shorter and stronger, and we had the introduction of Lucy Lockit and her father. Lucy Lockit is often portrayed as a firebrand, but in this production she is a rotund lady with the habit of very fast and furious waddling and when she fights, she doesn’t screech and get catty, she wallops a person in the face. Lockit himself was played with an almost pantomimic relish, and the less classy Lockit certainly matched Peachum for nastiness, if not for cunning. The scenes between Lockit and Peachum brimmed with menace (and the odd bit of slapstick strangling) the scenes between Polly and Lucy were wonderfully catty - but the best scenes were those between Macheath and Lucy. Those scenes ran on the dynamic that Macheath needed Lucy to escape and so had to give her promises of fidelity to get her on side, the relationship on stage was fantastic and improved further when Macheath fell over and Lucy had to fight the desire to corpse (and failed). Everything built to the end - and what a way to end it, I was surprised, dismayed and delighted and the ending was a big reason I went away with such a huge grin on my face. 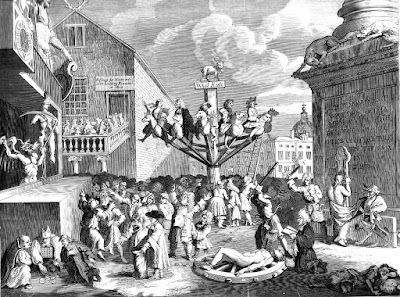 Macheath was loaded in the cart for execution and the cast went round and round the central staff of the scaffold, laughing, singing, drinking and eating oranges - in true eighteenth century style. The central part of the scaffold also revolved, adding to the chaos and reminding me of Hogarth’s comment on the South Sea Bubble. 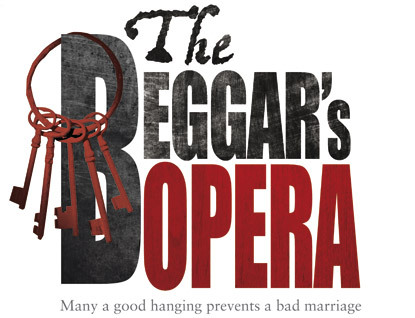 The noose was tightened around Macheath’s neck and it was perfectly possible that they were going to hang Macheath (as other productions have done), but then Mrs Peachum read the lines of the nobleman, arguing for Macheath’s reprieve, which he was given. He was slipped off the noose, picked Polly for his wife and the cast danced (but did not sing) to my favourite song ‘Thus I Stand Like A Turk’. I very much enjoyed finally seeing a production of ‘The Beggar’s Opera’ and I found the play lived up to the image of it I had in head (unlike recent productions of ‘The Rivals’ and ‘School for Scandal’, which I found disappointing). My only quibble was that the performance would have had more gusto and the ending more impact if the production was inside. The open air and trees dissipated some of the mood and madness the production conjured up so well. But it’s always better to leave the review of an opera on a high note- So, a message for anyone feeling a bit down, ‘Think on this maxim and put off your sorrow, the wretch of today will be happy tomorrow’.